Thursday already! Where does the week go? My friend Julian recently acquired an espresso machine, so I did some research to find interesting drinks that incorporate coffee. This one comes from Imbibe Magazine, and it stood out to me for several reasons. First, I liked that it treated coffee as the base “spirit”, similar to the way I did in the Bialetti Aspro. I went over to Julian’s on Saturday morning for coffee, and he was kind enough to pull a shot for this drink. He is a serious coffee geek, and he has a serious rig, so the coffee in this drink, which was made with Stumptown Roaster’s Hairbender blend, was top notch. Your drink is only as good as the worst thing you put in it, so go the extra mile to ensure that every ingredient is the highest quality possible. 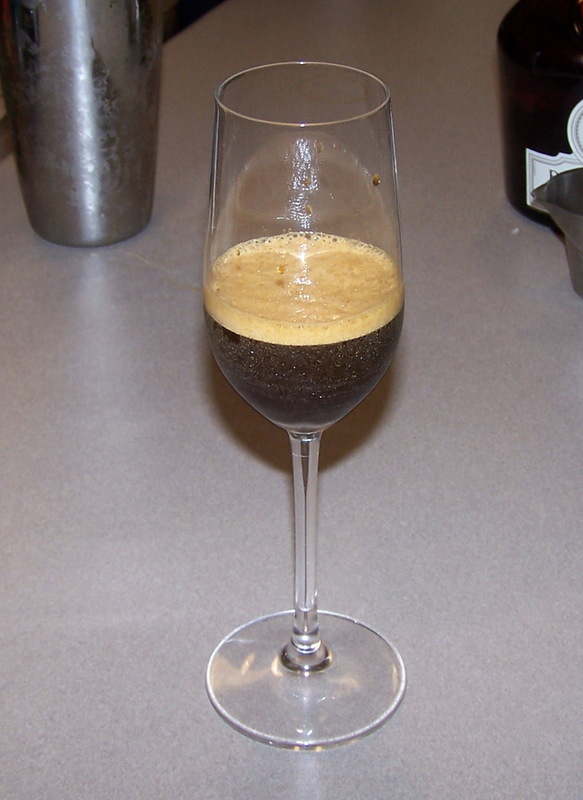 In Italian, fortifying a shot of expresso with a shot of liquor is called a Caffè Corretto, or “corrected coffee”, which is correct in the sense of being proper. I love the idea that it is proper to drink coffee that has been spiked with liquor, though I am also enamored with all of the many non-boozy incarnations of espresso, and I have been delighted to explore them. Shake over ice and strain into a fluted glass. The espresso in this drink was so oily, rich, and viscous, and shaking it gave it a beautiful foamy top. .5 oz of liqueur gave it the appropriate amount of sweetness, but it didn’t have quite the level of booze that I would have preferred. Half an ounce of brandy would probably have taken it from a B to an A, but it might also be the case that the espresso overpowered the other elements, and if I had used french press I think it would have been perfect. All things being equal, I think I would rather have the brandy, and stick to espresso. Categories: modern drinks | Tags: benedictine, booze, cocktail, cocktails, coffee, corrected, correto, drinking, drinks, espresso, liqueur, maraschino, mixed drink | Permalink.